With a private hot tub and a wonderful location near parks, lakes, restaurants, and wineries, this cozy Santa Rosa vacation home is the perfect home base for couples looking to explore beautiful Sonoma County. 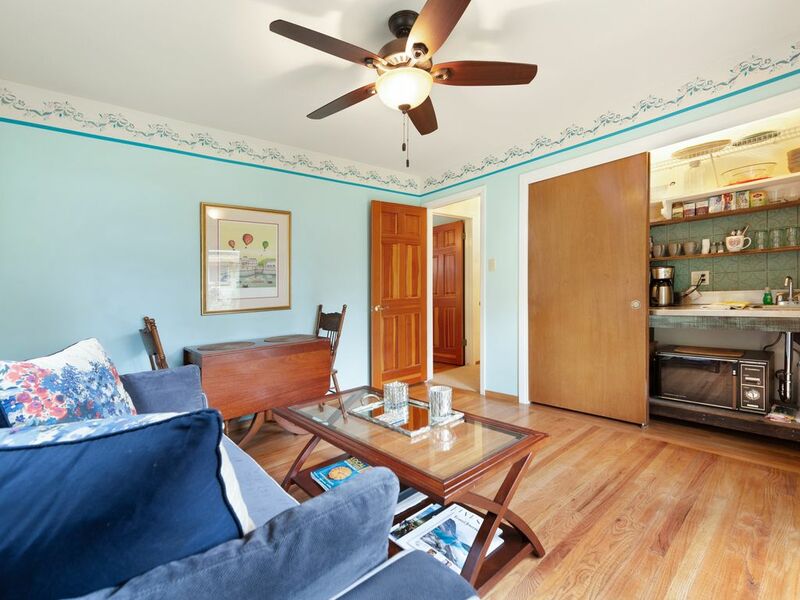 Ideally situated four miles from the Railroad Square Historic District and just blocks from Howarth Park and Spring Lake Regional Park, this one-bedroom in-law unit is also close to a variety of local winemakers in the Highway 12 corridor. The 400-square-foot living space is intimate and comfortable, featuring colorful decor, WiFi throughout, and glass doors that face the garden. Spend an evening at home playing board games, or step into the bedroom to find a flatscreen cable TV with Netflix, Hulu, HBO GO, and Pandora. There is also a private hot tub and a shared sauna you may use during your visit. With more than 400 wineries and dozens of world-class restaurants in Sonoma County alone, guests will need a place to store their tantalizing dinner leftovers and souvenir bottles. And you'll find a convenient kitchenette here with a mini fridge, microwave, blender, toaster, coffeemaker, and even a coffee grinder. Planning to pick up a few local ingredients at the Santa Rosa Original Certified Farmers Market? Enjoy an outdoor picnic at one of the nearby vineyards or eat inside at the dining table for four. The Hummingbird Garden Retreat can sleep a maximum of four guests (two adults and two children - up to three adults can stay at once). You'll find a queen bed in the air-conditioned bedroom and a double-size sofabed (6'4" x 4'10") in the living room, as well as one full bathroom for guests to share. Surrounded by the golden hills and 17 American Viticultural Areas of Sonoma County, Santa Rosa provides its visitors with easy access to the best of Northern California. You'll find the St. Francis Winery & Vineyards just five miles away, beautiful Jack London State Historic Park just 26 miles south, and the headwaters of Sonoma Creek in Sugarloaf Ridge State Park only 10 miles east. Don't wait another day to book your Northern California wine- and food-tasting adventure - reserve this Sonoma County home today! Parking Notes: Please only park on the left side of the driveway and do not block the right side. There is room for two cars in tandem. Keep in mind that there is no on-street parking. It was like having your own house. Very quiet, reclusive, and private, except Hiway 12 is 20 ft from the door. It truly was peaceful except for the road noise. I would stay there again. This location really can't be beat for a romantic, relaxing stay. We enjoyed our stay very much. We were under the impression that it was a separate cottage from the main house but it's actually converted rooms on the owners home. We were comfortable as the owner wasn't there but it would've been awkward using the hot tub if he was as the hot tub is outside his patio doors. The house is located on a very busy road but we slept well. This property suited us perfectly for our visit to the Sonoma wine country. It was within a short drive of restaurants and the tasting rooms we wanted to visit.